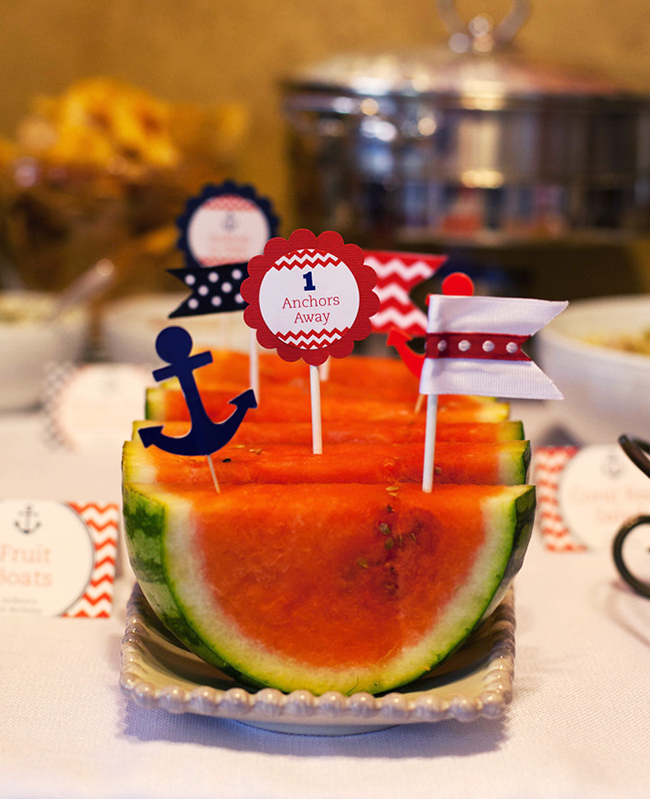 Nautical party for a first birthday! 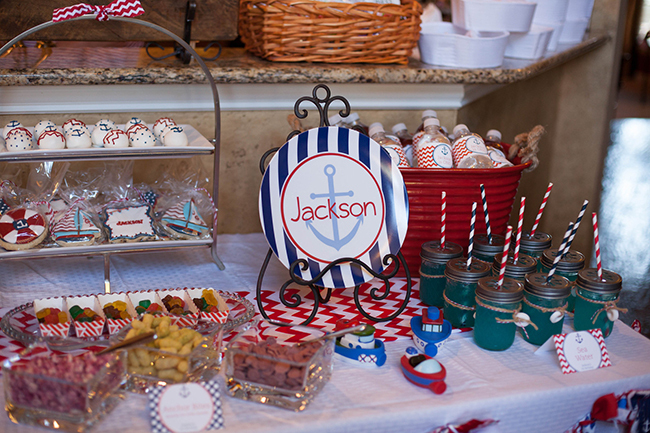 Nautical party: Jackson is 1! 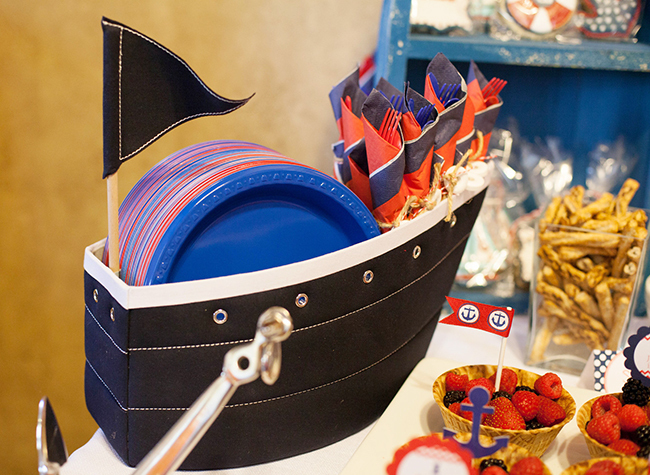 This nautical theme first birthday party is so sweet! It was styled by my wonderful customer Jenn for her son, Jackson. 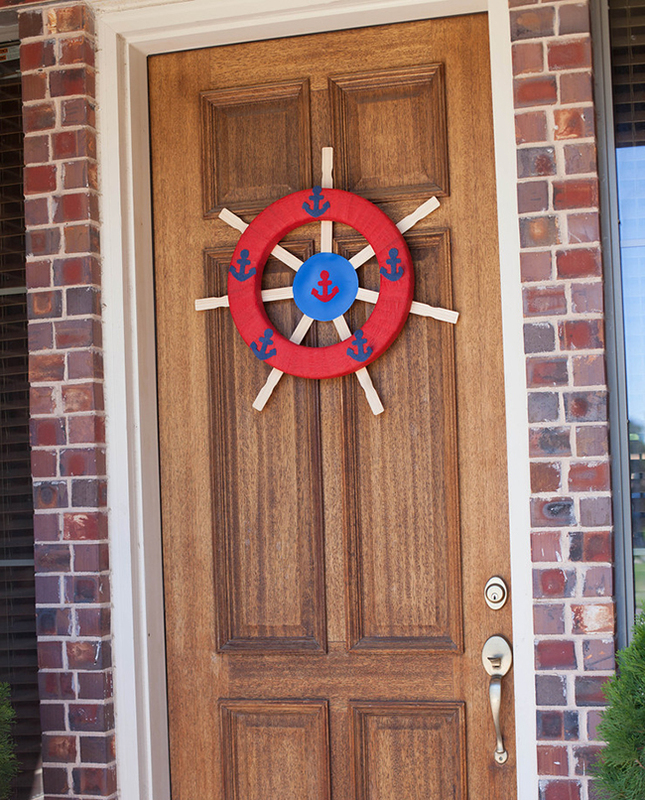 The front door wreath is a ship’s anchor made from a yarn-wrapped styrofoam ring and wooden stir sticks (so clever, and perfect for a nautical party!). 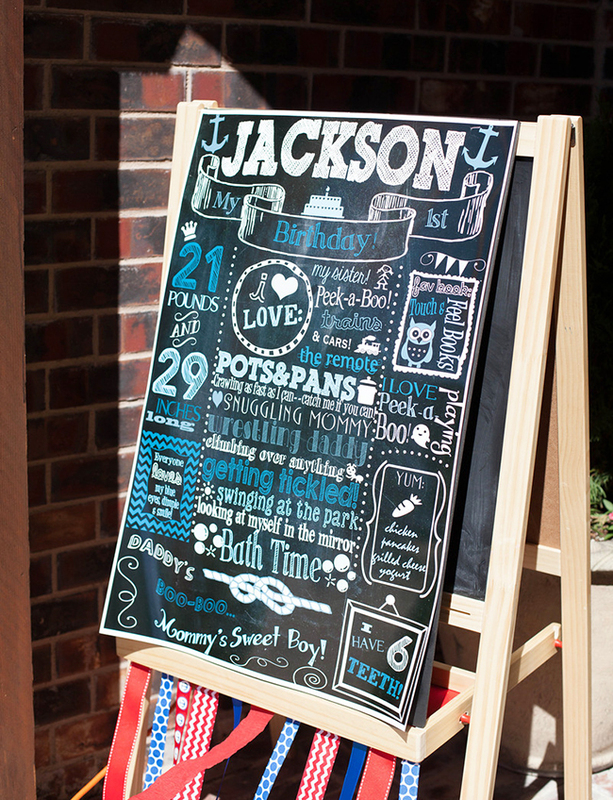 Jackson’s chalkboard sign is a printable by PickleNoodle Boutique that Jenn printed at Costco on a poster size sheet, then taped to a chalkboard. 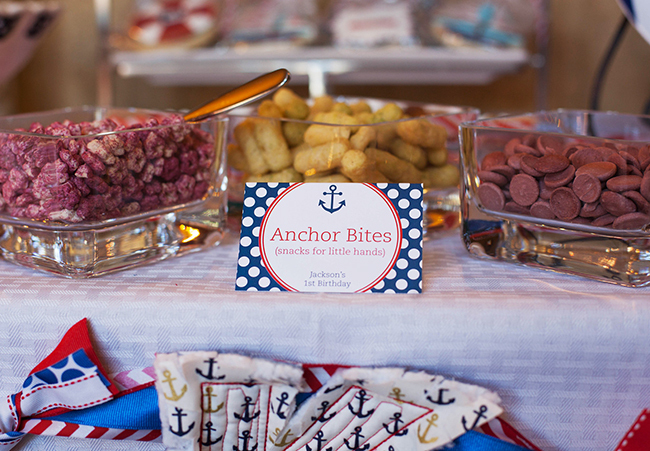 The food table backdrop is made from anchor patterned and chevron patterned fabrics, plus a large wooden anchor. 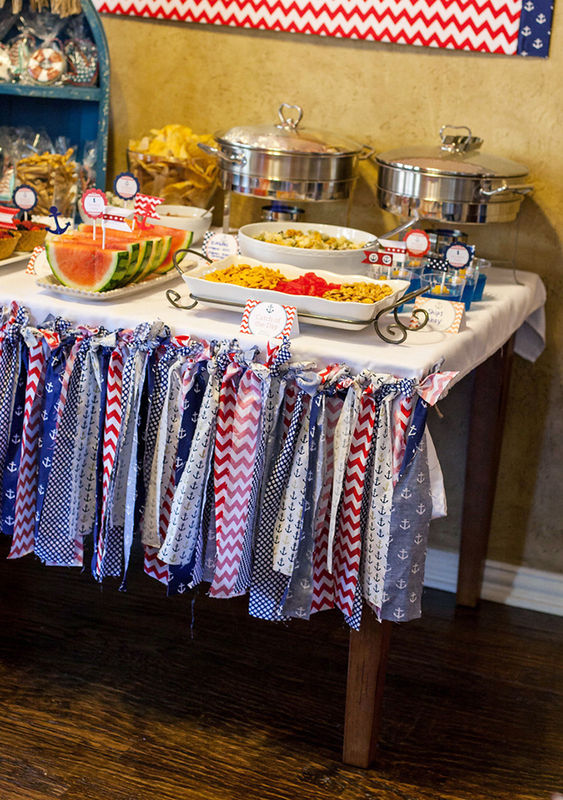 Strips of coordinating nautical fabrics were used to make a table garland. 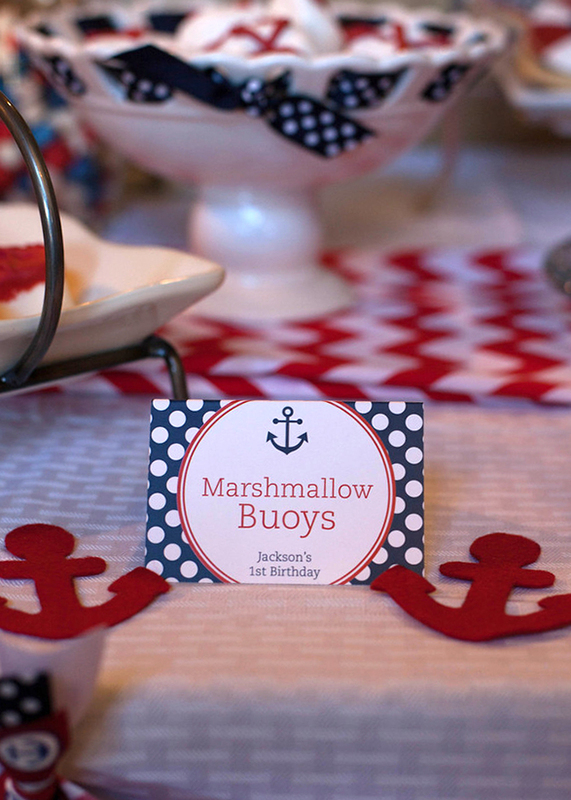 The “Marshmallow Buoys” were marshmallows dipped in melted red chocolate candy. 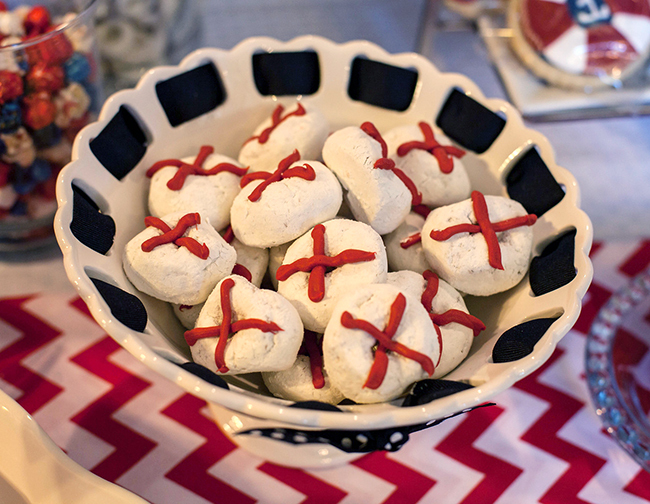 “Life Preservers” are made from powdered donuts criss-crossed with melted red chocolate candy. Sweet Art Bakery made the cake balls and Cravings made the cookies. 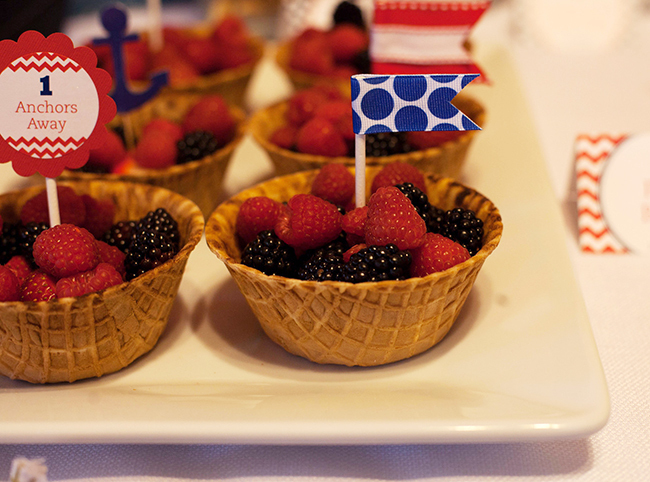 Fresh fruit was served in ice cream cone bowls. 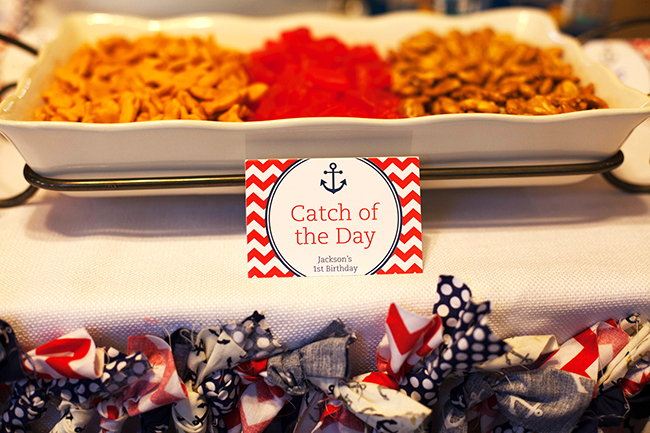 The “Catch of the Day” included Goldfish crackers. 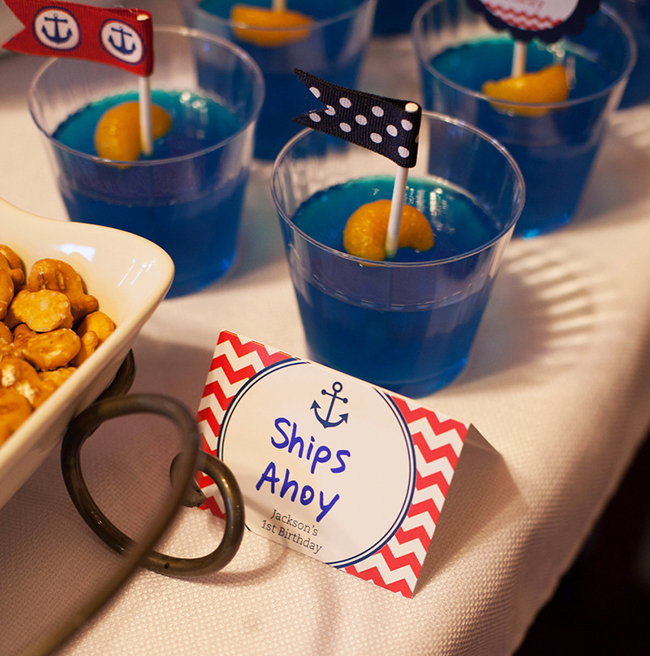 “Ships Ahoy”: Blue jello with mandarin orange boats. 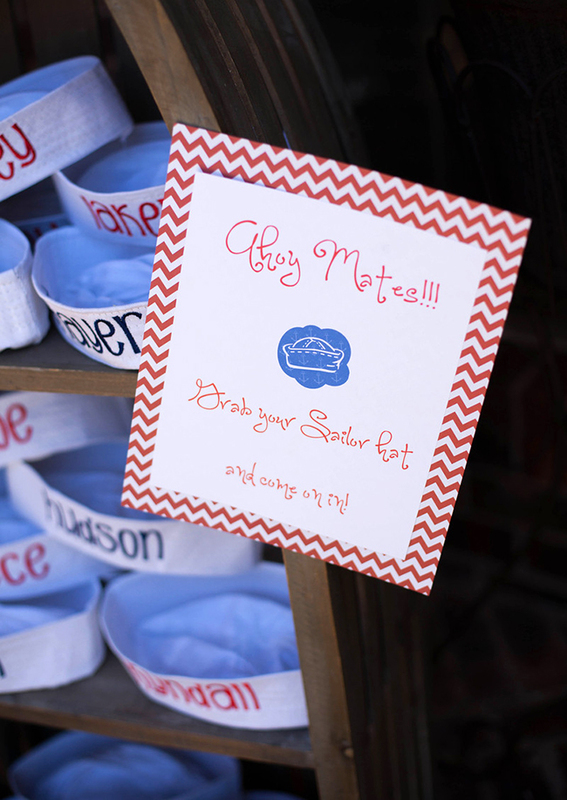 Rosie Posie Designs made the personalized melamine plate. 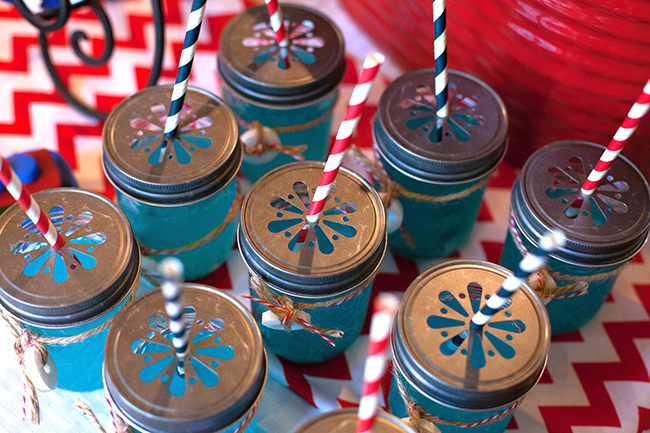 The “Sea Water” is blue punch served in mason jars. 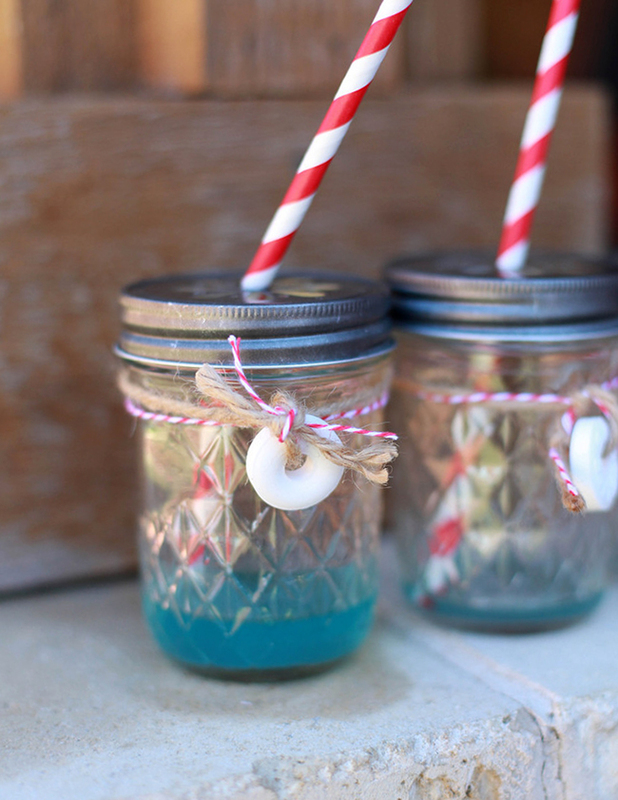 Baker’s twine and jute twine were wrapped around each jar with a Life Saver candy. 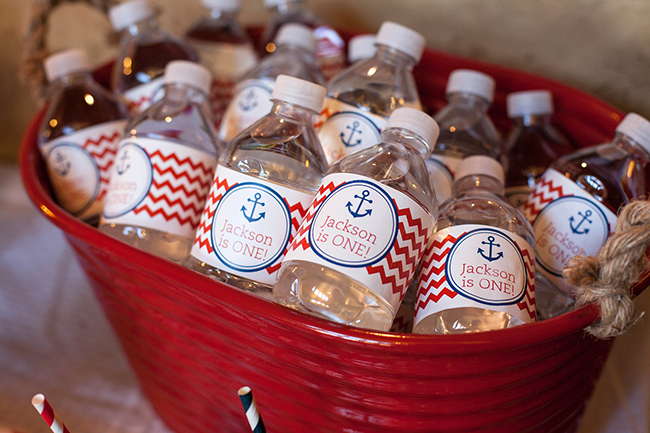 The personalized chevron water bottle labels are from Chickabug. 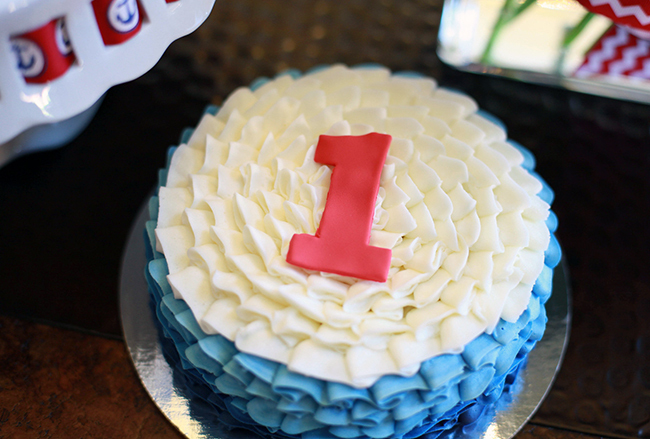 The blue ombre ruffle cake was made by Sweet Art Bakery. 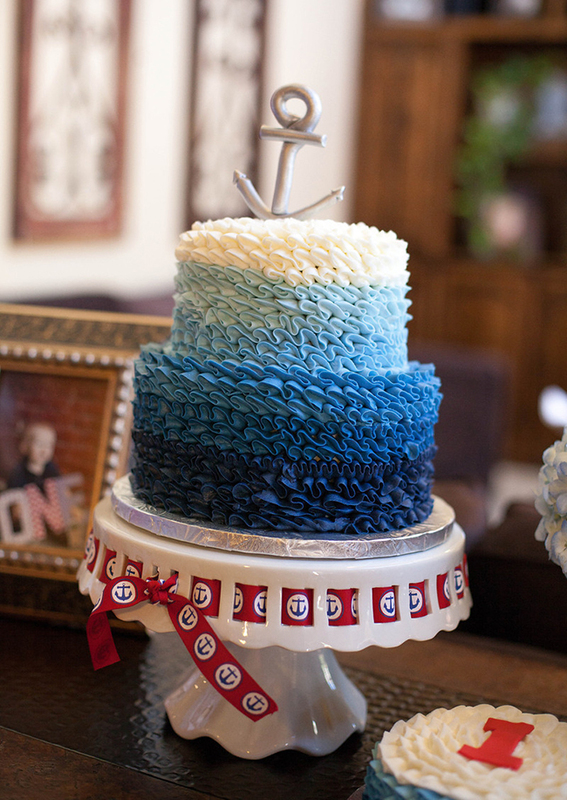 I love how the ruffles look like ocean waves! 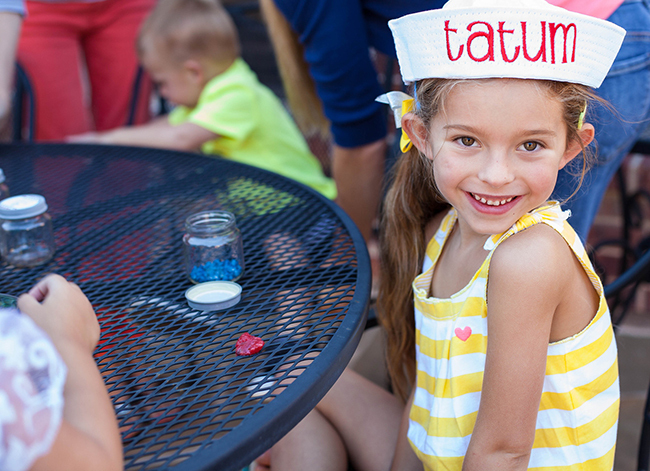 The kids made snow globe aquariums as a craft, and then they doubled as party favors! Jackson’s personalized hat is by Pixie and Penelope. 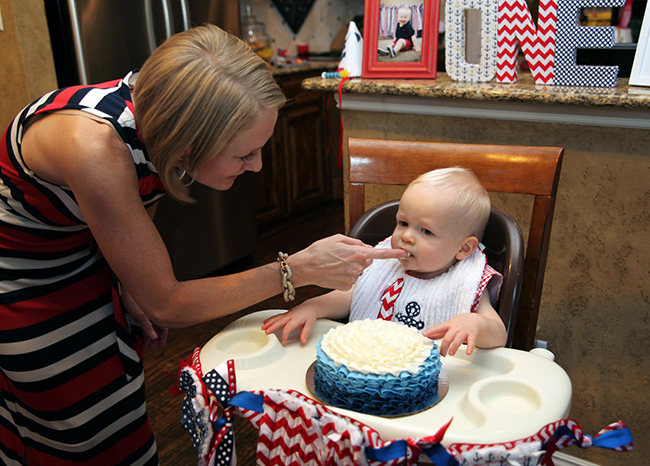 His personalized bib and “ONE” high chair banner are from Miss LuLu’s. 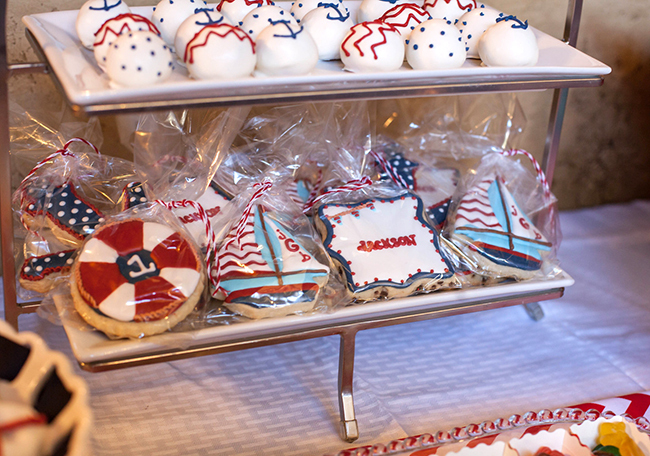 For party favors, in addition to their monogrammed sailor hats, each child took home a nautical themed notepad and a package of markers wrapped in a bow. 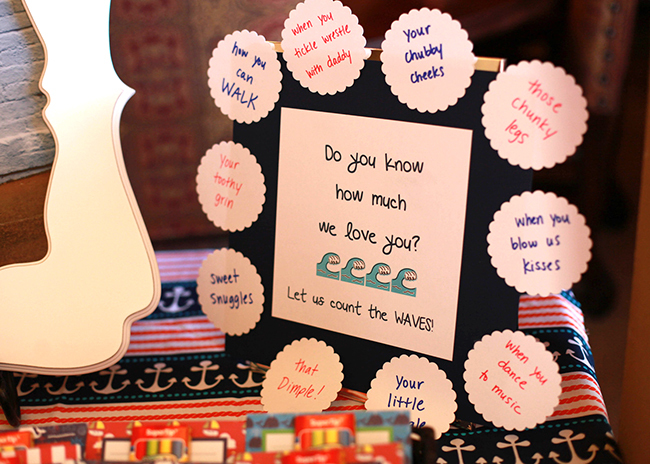 Shop for personalized nautical theme party paper goods and printables here. 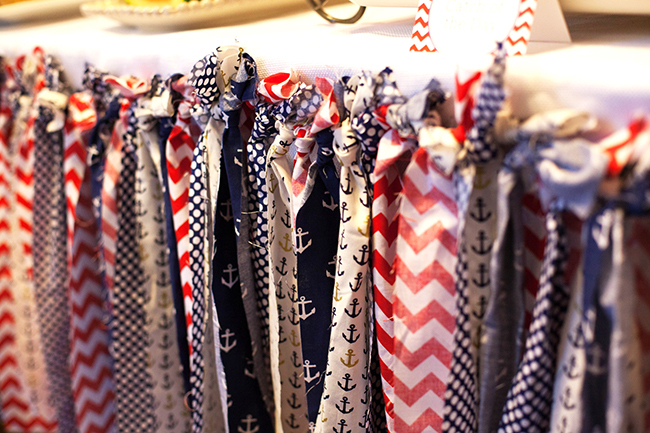 Or, check out more nautical party ideas on Pinterest or here on my blog! Love ALL of your ideas! 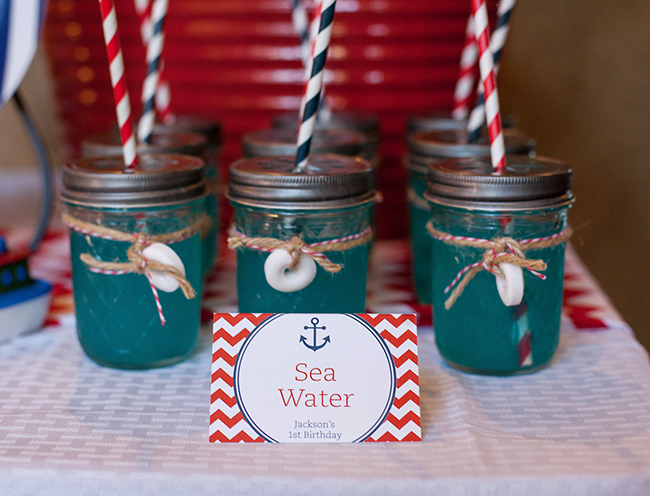 In the process of planning my daughter's 1st birthday party, (nautical theme as well,) and thought the mini aquariums were the cutest! Can you share details on what you used to make them and if they held up well? with the aquariums you put a link to the tutorial, but she used glitter and i really like yours better. what are the blue things you put in yours? is that the rocks from a fish tank? Whats the sailboat made with? It all looks way fun! Everything is absolutely precious. My baby boy is 28 and getting married. 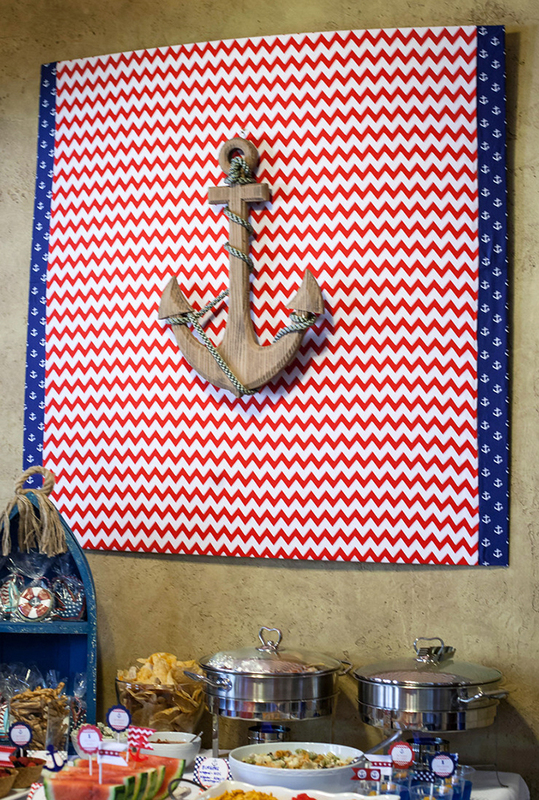 I'm using a nautical theme for his rehearsal dinner. Looking for a boat the size you have the sailor hats on would you tell me where you got it? Hi Lisa! 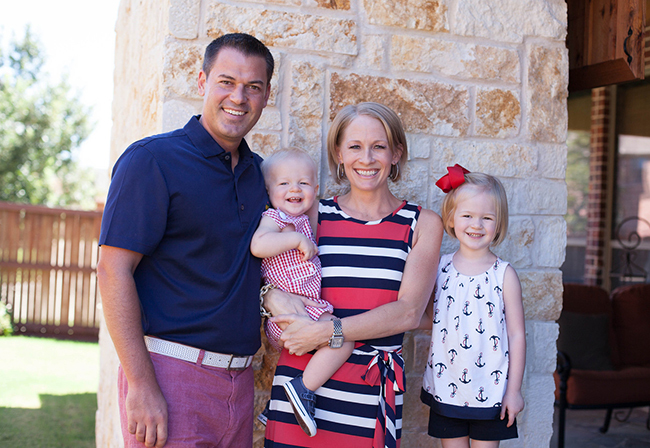 I'm not sure where Jackson's mom, Jenn, got that boat. Sorry! I love these ideas! 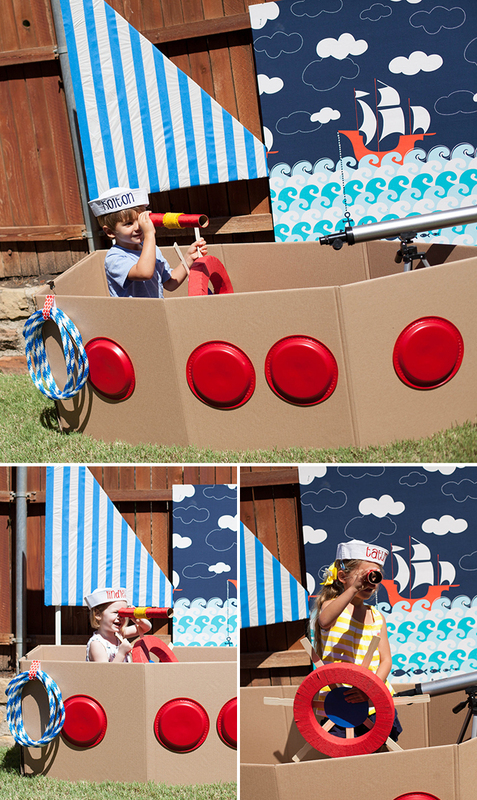 I am busy planning my son's first birthday party and we are doing a nautical theme as well! 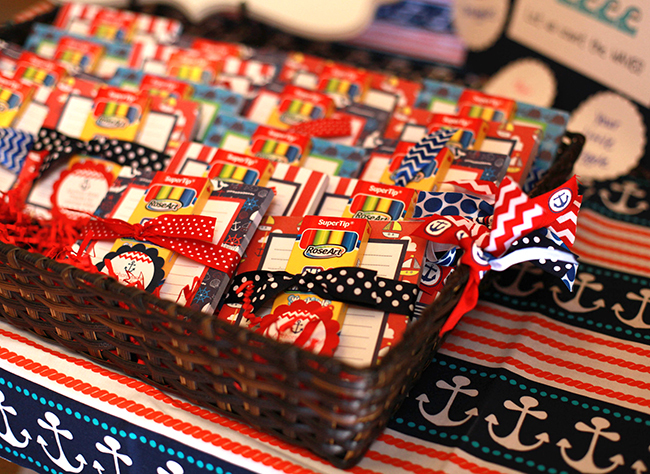 I was wondering where she purchased the nautical notepads and markers? Hi I love this party! I was curious where you got the boat shelf that the sailor hats sat on? Thanks so much! I really love the sailboat!!! I'm gonna try it this week for my daughter's school play. 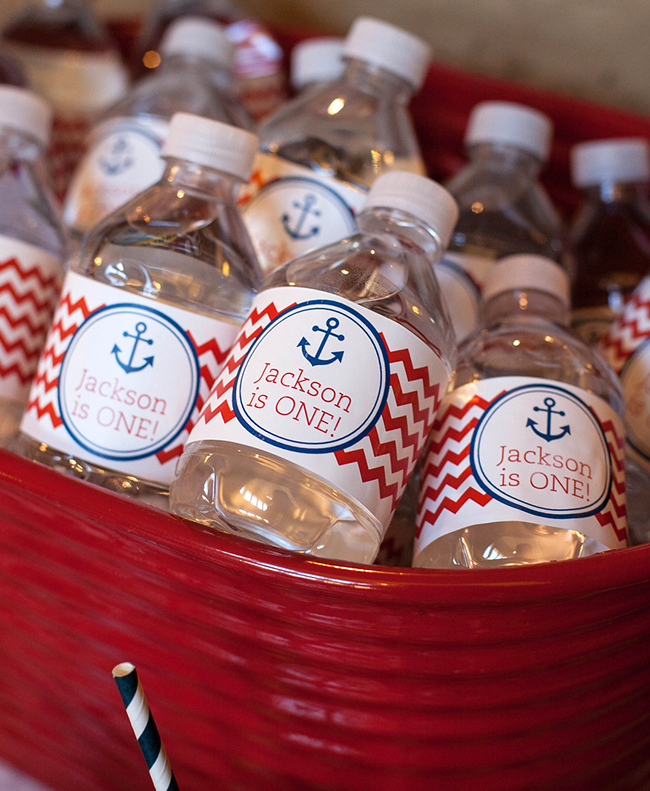 Reference: "Nautical Party-Jackson is One." 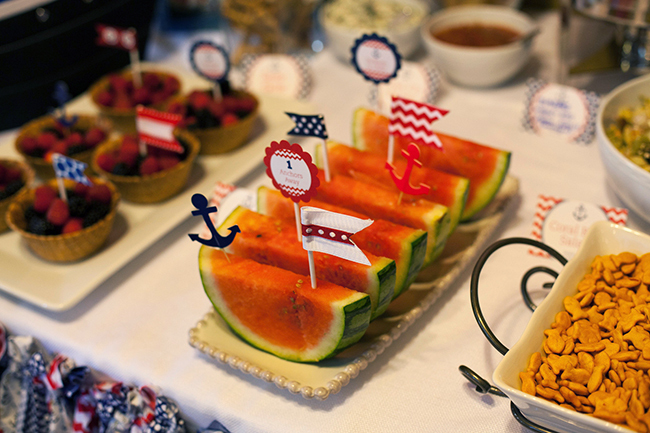 I am "Sail-A-Brating" my 50th Birthday with a nautical themed party and would like to know if the ship with the grommets holding the plates/cutlery was purchased or was it a DIY project? If it is a DIY, where can I get the instructions? If not, where can I buy it? It would be absolutely perfect on the buffet. I am eagerly "Aweigh-ting" your response. 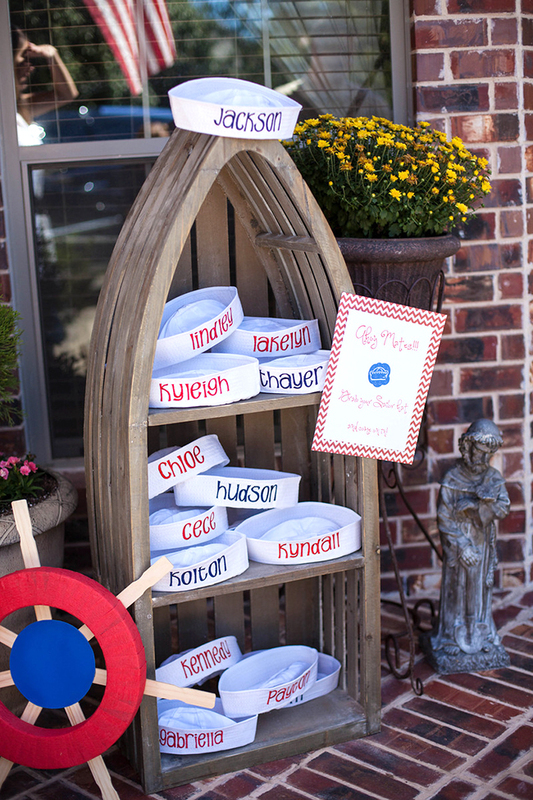 Where did you get the boat that holds the sailor hats? 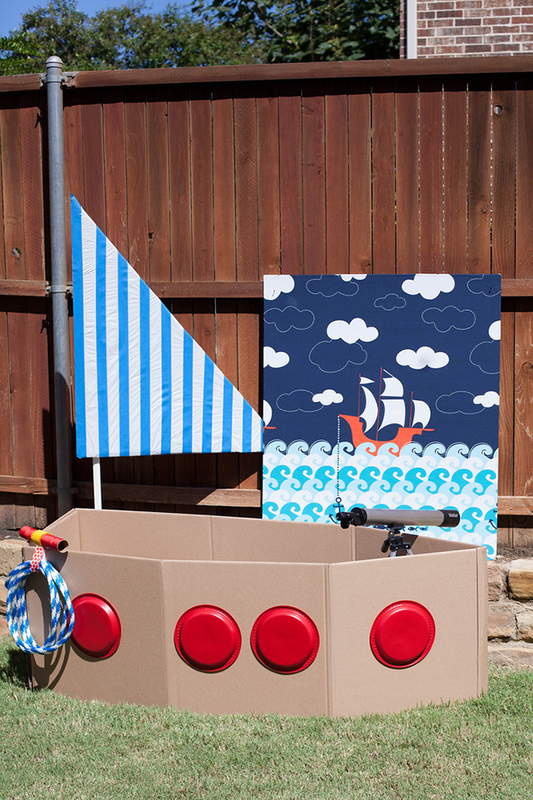 Also, can you share directions for how to make the big boat for the kids? Hi SJ! 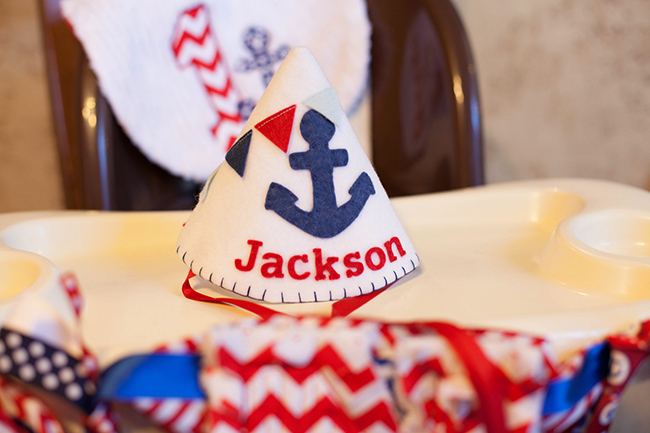 Sorry, I don't know where Jackson's mom got the boat with the hats or how she made the large boat. 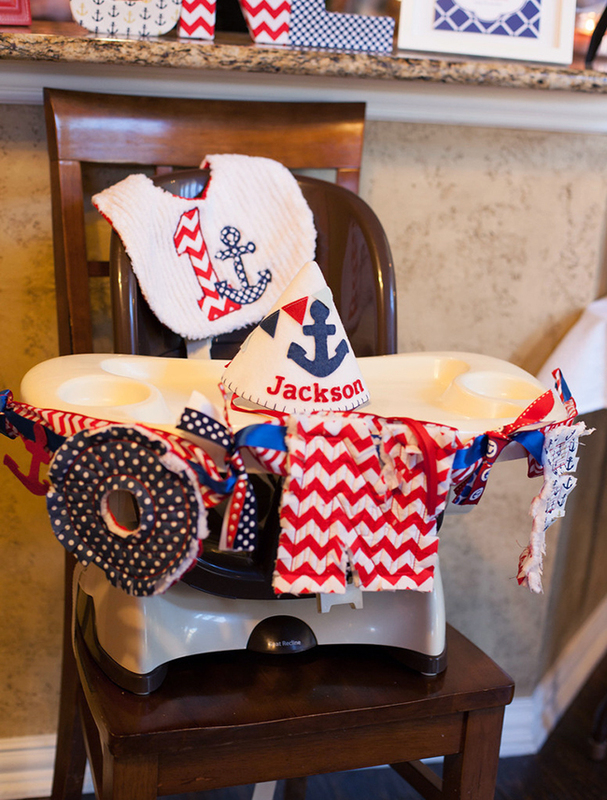 Hello, I am in the process of planning a nautical themed baby shower. I absolutely love the ideas above. One question: any idea where I can find the ship prop the embroidered hats are on? That would complete my sweets table. The fabric background was a great idea. Love it!!! Hi Tricia! I'm very sorry, I don't know where Jackson's mom got the prop.